I'm sure he's glad to finally claim that basket as his own! Oh, he is a beauty! I have a basket like that filled with yarn and the cats fight over who gets to mash the yarn down today! Pictures of cats in things never gets old! Well, NOW that Mailing has gotten out of the basket. FINALLY!!! Marcel looks so small in there. Very cute photo. Aw - Marcel is so sweet! (Though Mailing was just as cute in that basket! 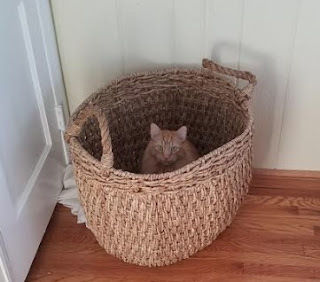 Cats and baskets.. a match made in heaven. Have a fabulous weekend.. I'm going to rest up from a busy week. We had snow. Mark golfed anyway. We had a CRAZY storm yesterday but the sun is shining today - and Mr. Weatherman says it will again tomorrow. Yay!! Hope your weather cleared up too.